It’s not every day one gets to spend a couple of hours enjoying the perks of a AAA Five Diamond, Mobil Five Star hotel. 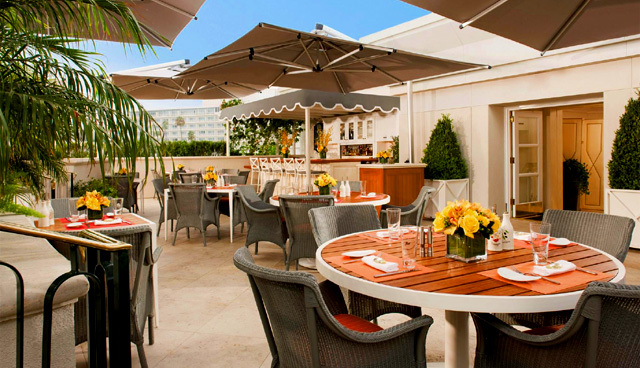 This summer, that day happens to be Thursday, at the acclaimed Peninsula Beverly Hills. From May 7 through Labor Day, the renowned luxury hotel hosts a weekly Happy Hour from 5-7pm in its newly renovated Roof Garden. During Happy Hour, drinks (cocktails, wines by the glass, beer) are half price, and valet parking is complimentary. Yes, thanks to the Peninsula, the words “discount,” “free,” and “Beverly Hills” can all be used in the same sentence. First up was the Speckled Jalapeño Margarita, made with Patron Reposado Tequila, fresh citrus juices and Grand Marnier. A jalapeño garnish added a touch of whimsy to the presentation. While I love all things spicy, it’s not to everyone’s liking and in cocktails can detract from their enjoyment. Here, the muddled jalapeño pepper added just enough of a spicy kick to get my attention without being overpowering. The citrus flavors were nicely balanced, slightly tart but mellowed by the smoothness of the cognac. All in all, it’s a nice twist to a familiar drink, and a cocktail well-suited to its surroundings. From the appetizers list, the Mini Halibut Tacos should pair nicely with the margarita. Not to be outdone was the Pomegranate Mojito, another riff on a classic cocktail. Bacardi rum, pomegranate juice, lime juice, and mint leaves were combined, strained into a glass, and topped with citrus foam. The foam added texture, the pomegranate provided striking color and subtle flavor, and the lime and mint hinted at the original mojito. From taste to presentation, it’s a perfect melding of cocktail and setting and sure to be a favorite throughout the summer. I’d probably select the Citrus-Marinated Kampachi to go with this refreshing cocktail. Other signature drinks include the Mugatu (Veev Açaí Liqueur, crushed strawberries, limes and mint with a splash of club soda) and the White Peach & Pear Martini (Grey Goose Pear Vodka, white peach pureé and fresh basil). The bar program was created in-house at the Peninsula, and is unique to the Beverly Hills property. The high quality and seasonality of the ingredients also means that not all of the menu items will always be available. Not that I’ll need encouragement, but it’s reason enough for repeat visits to explore the Roof Garden’s latest offerings.